One of the biggest narratives surrounding Syracuse basketball this season has been the Orange’s inability to get production from the center spot. 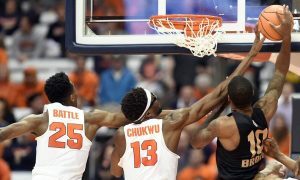 Paschal Chukwu and Marek Dolezaj have improved their games a touch over the last week or so, but still, Syracuse hasn’t had a standout center since Rakeem Christmas in the 2014-2015 season. Unfortunately for SU fans, they’ll be waiting at least one more year for an elite big man. 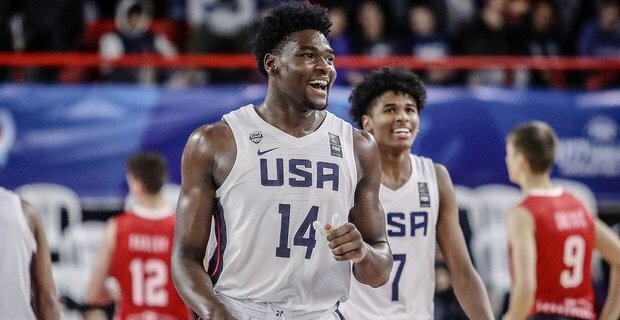 2019 five-star center Isaiah Stewart announced his decision at halftime of the IMG Academy vs Oak Hill game on Sunday night and he’s headed to join former SU assistant Mike Hopkins at the University of Washington. Hopkins was Stewart’s primary recruiter when he was at Syracuse and even had a permanent parking spot outside of Stewart’s high school gym when he was still playing in Rochester. Not only is Stewart a five-star recruit, but he’s also one of the top six 2019 prospects in the entire country. 247Sports has Stewart rated as the sixth best player in the class while ESPN has him one slot higher at #5 and the worldwide leader’s national recruiting expert is pretty high on Stewart’s potential. Clearly he’s a big-time prospect if somebody like Biancardi is raving about him, but losing out on Stewart hurts a little bit more because of how well he would have fit into the Syracuse system. 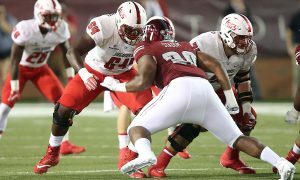 At 6-foot-9, 245 pounds, he’s built like your prototypical SU center: thick, stocky and athletic even though he may give up an inch or two to other bigs he goes up against. What he lacks in height though, he makes up for in length. Stewart sports a 7-foot-4 wingspan and is an elite level rebounder, especially on the offensive glass, which is somewhere that the Orange always struggle. As for offense, well, pretty much any production from the five-spot would come as a welcome change and Stewart has the ability and athleticism to make a difference on the offensive end. Losing out on Stewart also hurts because it proves that SU and other former members of the Big East don’t have as firm of a grasp on the state of New York and the northeast as they used to. It used to be almost guaranteed that a guy from Rochester like Stewart would stick up north and SU would have a huge advantage in picking him up. Stewart’s decision to head to Washington and the Pacific Northwest instead of Central New York proves that advantage doesn’t seem to exist anymore. So without Stewart coming to Syracuse, where do the Orange turn now for the center position over the next few seasons. Well, first, they have to maximize the talent they already have on the roster. Dolezaj has shown flashes of brilliance at times this season and will still have two years left after this season. The same can be said for Bourama Sidibe, although his development will be a bit of a longer and more arduous process. The ’Cuse also already has a center coming in the 2019 class in 6-foot-10, 205-pounder John Bol Ajak. Unlike Stewart, Ajak fits more in the mold of a Chukwu or Sidibe. He’ll match up better in terms of height with other ACC bigs, but he won’t be nearly as physical or athletic as a guy like Stewart would have been. Losing out on what is an essentially hometown guy in Stewart obviously hurts for Syracuse. He would have been a huge add and would have more than made up for the Darius Bazley catastrophe last cycle, but it just wasn’t to be for Syracuse. Now the Orange have to regroup and find a way to add talent at the center position in the next few seasons.